My parents got this Renwal model for me when I was about 12 years old. It toook the skill of my father to build it for me so as to keep the clear plastic clear without getting the glue all over it. He did a great job on it and was truely a father and son experience. I did build the distributer under his guidence (so it would work) and the red spark plug lights fired perfectly. He also told me that there were a lot of errors in both the instructions and the molded plastic parts as well. The cylinder heads will not fit right unless you cut some of it away. This model was designed under Chevrolet's first V-8 engine, a 265 CID 1 barrel carburetor engine making 148 horsepower. When it made its way into the first production car (I believe it was the 1955 Corvette) it was upgraded to a 2 barrel carb and the horsepower increased to 165. BTW, there was a knock-off of this model made by Revell. I call it a knock-off because it was stripped of the functioning distributer, lighting spark plugs and electric starter motor and added a hand crank instead. Revell did however correct the cylinder head fit error. Thanks for posting the video. Wow. I half expected to hear a loud noise followed by an explosion of sorts. Phew! Amazing! 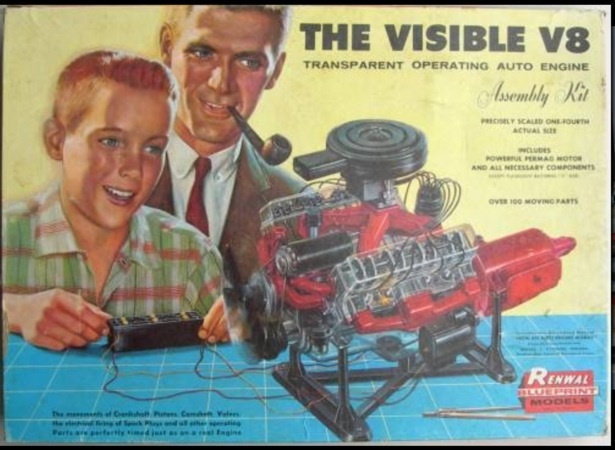 What toy manufactured in 2015 compares to this beauty of 1964, I wonder. I enjoyed reading all the anecdotes posted here too. My sister and her husband bought me this for Christmas in 1964. My brther-in-law told me he wanted to see it working next time they cane to visit (He was in the Air Force). It was the one model I took my time building. When he came he helped me time it so the little lights representing the spark plugs would light at the right time. It was awesome! So, have you seen the YouTube video where they run one of these babies up to 7000 rpm? Had one of these too! After a while, took it apart again, and attempted to build a space craft using parts of it and other models. . . This is one of the few toy/hobby items I recall begging my parents to buy. I did successfully build it, and it worked (although not smoothly). Then I lost interest in it.